The original Hove Town Hall, first known as the Brunswick Town Hall, was in Brunswick Street West. In 1878, Alfred Waterhouse was appointed architect of the new Town Hall. Having already designed the Natural History Museum in South Kensington (1868), and the Manchester Town Hall (1877), Waterhouse was chosen by the Commissioners without holding a competition. When the Chairman of the Hove Commissioners opened Hove Town Hall on 13 December 1882, he described Waterhouse’s buildings as ‘things of beauty and a joy for ever’. The building, which cost about £50,000, was designed in Victorian Gothic perpendicular style, with a 40 foot high Great Hall measuring 91feet x 60 feet, large enough to hold 2,000 people. There was a 110 foot tower containing a 12-bell carillon and a clock with 4 dials (each measuring 7 feet x 6 inches) and illuminated faces. Gillet and Bland of Croydon supplied the bells which cost £1,567 and played 14 different tunes including Home Sweet Home, Men of Harlech, Auld Lang Syne, Rule Britannia, God Save the Queen and Sussex by the Sea. In the early hours of Sunday 9th January 1966, catering contractors cleared up after a dinner and dance held by a Crawley engineering firm. A fire started, possibly in one of the rubbish bins, and the alarm was raised at about 5am by Jimmy Ferguson of Osborne Villas. The Hall Superintendent, Stanley Burtenshaw, his family and two friends were trapped by the blaze and had to be rescued from their 2nd floor flat by the Fire Brigade. Firemen carried Mr Burtenshaw, who had been overcome by smoke and was unconscious, down the ladder, but the others managed to climb down unaided. Shortly after the fire, which had destroyed the Great Hall, the Council Chamber, offices and the Magistrates’ Court, a report by the Town Hall said that it was decided to retain as much of the fabric of the building as possible, pending decisions on its future. In the meantime, Hove’s civic administration transferred to Brooker Hall, an art gallery and museum in New Church Road. The western part of the building, which had not been seriously damaged by the fire, became the temporary home of the magistrates’ court and court offices until they moved to the new law courts in Holland Road. 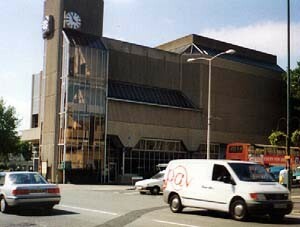 This marked the end of the Hove Town Hall and this last remaining part was demolished in November 1971. For the next couple of years there was a great deal of debate about preserving the shell of the building and redesigning the interior. Eventually, however, it was decided that a completely new Town Hall should be built and, in January 1968, the plans went on display. Planning permission was granted in October 1968. John Wells-Thorpe, of Gotch & Partners, Richmond Place, was chosen from a shortlist of six, with a tender of £1.4m; the contractors were Walter Llewellyn & Sons of Eastbourne. Building work continued throughout 1972 in spite of a strike by UCATT members in May and flooding problems which necessitated extra 20 foot pilings, a total depth of 60 feet. The building was constructed using 900 concrete cladding units, each weighing two tons, inset with huge panes of tinted glass called ‘Spectrafloat’. Lord Rupert Nevill opened the new Hove Town Hall on 5 March 1974. The final bill was £2,911,283, more than double the original tender. A new extension was added in 1991 to house the Registrar’s office, a Citizen’s Advice Bureau and a Tourist Information Centre. The original town hall also had a four manual concert organ built by ‘Father’ Henry Willis, one of the greatest Victorian organ builders. It was virtually identical to one still in Oxford Town Hall. Both were designed by Sir John Stainer, organist of St. Paul’s Cathedral, London. The organ formed the visual focal point in the great hall. There was a great hue and cry in the early 60s when the councillors decided to modernise the hall and this brought about the removal of the organ. Paradoxically this saved the instrument when the building was gutted by fire. The Willis was re-erected unaltered at a school in London, where it may still be heard. The Borough Organist and Carilloneur from the 20s until the organ was removed (and the bells fell) was Samuel Baker. He was also organist of St. Mary’s Rock Gardens, and owned an art shop very near the town hall. He built one of the first houses in Roedean Crescent which had a large music room built using ancient timbers. Apart from the Harrison organ (later given to Saltdean Church), he had two grand pianos and many first edition books and paintings. My dad was the man holding the Hove town hall clock in the photo that the Argus took, I believe in the 70s. I would like to find a copy of this photo, better still some info on it, any one know where to look? I have been researching my family history for a year now and have found an interesting connection with Hove. An ancestor of mine, Flora Roe, married a John Blundell at Brighton in 1879, and they lived at 93 Eastern Road, Brighton in 1881. John was a grocer and unfortunately died at the age of 29 years in 1888. Searching for Flora on the 1891 census, I found her as nurse to the family of Major John Oliver Vallance at Brooker Hall, Church Street, Hove in 1891. Her name of course was now Flora Blundell, widow, age 30years. Imagine my delight and surprise when I found the history of Brooker Hall and how it had now become the Hove Museum and Art Gallery. Flora would have been a fairly important employee of the Vallance family and I should love to know whether any photographs of the family are in existence, which possibly could include Flora. My own father was an orphan and I have no photographs of my ancestors apart from his siblings. It has been most interesting to read about the history of Brooker Hall. I would be most grateful for any information on this. Originally from Brighton, (believe me there are not many of us left these days) I went to study in London for three years and returned to Hove around three and a half years ago. I live in Hove and have lived at the bottom end of Holland Road for just over three years now. I believe the building that I live in to be of Regency Period? Around 1830 (I think). I adore living in an old building; they have so much more character and a great homely feel. Can anybody please confirm if the homes on the left side of Holland Road, leading down to the seafront, are of Regency period? I have been trying to research this on the net and have only found Regency buildings starting from Regency Square, going along to Kemp Town. Another thing that has always baffled me, is that the four houses opposite were probably built in the 1930s? Can anyone who was living in or around Hove before the 1930s, (or anyone that knows any info) please tell me if there was ever a bomb in the war in that spot backing off of Adelaide Crescent? Lou, as far as I remember, the houses in your area of Holland Road are late Victorian (1870s/80s). Those more modern houses opposite were built on land backing on to the rear mews of Adelaide Crescent.